1. 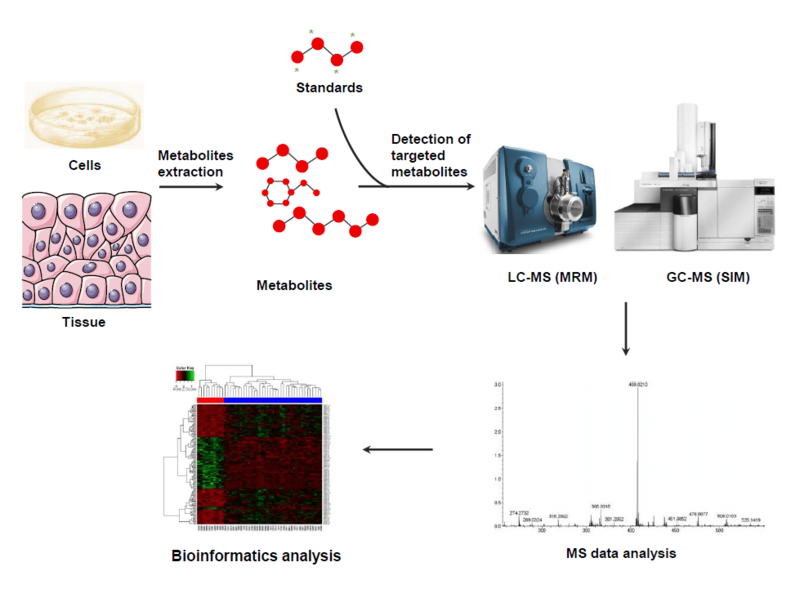 Data collection: Targeted metabolites standards are synthesized and the MRM transition values of the standards are measured by triple quadrupole MS.
2. Quantitative analysis of samples along with the standards using triple quadrupole MS.
3. Statistical analysis and bioinformatics explanation: ANOVA, PCA, KEGG annotation, etc. 2. Animal body fluids samples: such as urine, blood, saliva, etc. Samples must be added with anticoagulant and preservative reagents right after sample collection, followed by freezing at -80°C. 3. Plant tissues: 200 mg/sample. Samples should be frozen in liquid nitrogen right after sample collection, and then transferred to -80°C for storage. 4. Serum samples: Repeated freezing and thawing of sample must be eliminated. Serum samples should be settled down at room temperature for 30 min in the collection tube, and then transferred to centrifuge tube and centrifuged at 8,000 rpm, 5 min. After centrifugation, supernatant is aliquoted to freezing tubes with 500 uL/sample, and stored at -80°C. 5. Urine samples: 1 mL/sample. Urine samples can be aliquoted to centrifuge tubes with 1 mL each tube, with addition 1/100 (w/v) sodium azide, and stored at -80°C.